After four years spent living in New Zealand, ex RAF pilot Jon and GP Gill Flewers bought an unseen plot of land in the Malvern Hills and built themselves a three-storey upside down house designed to make the most of the wonderful scenery. This was a very ambitious project featured in an episode of Channel 4’s, Grand Designs (Season 18, Episode 1) which chronicled the problems and challenges the couple were up against in building a house on such a steep slope. Roof Assured by Sarnafil installer, Cheltenham & Gloucester Cladding Ltd. (www.cgcladding.co.uk) based in Cheltenham, installed the Sarnafil roofing system on this hugely impressive property. With curved walls and clad in timber the attention to detail throughout the property extended to the flat roof areas with the C& G team delivering a beautifully finished roof to the magnificent building. 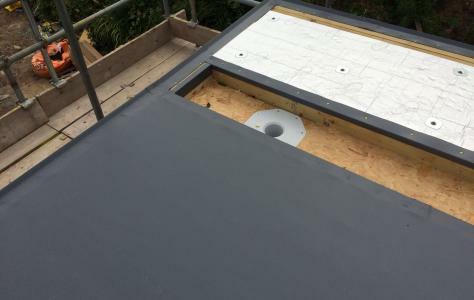 The roof construction consisted 140m2 of Sarnafil lead grey single ply roofing membrane, mechanically fixed over a 18mm timber deck, a Sarnavap vapour control layer and Sarnatherm S 150mm thick insulation insulation to create a warm roof. 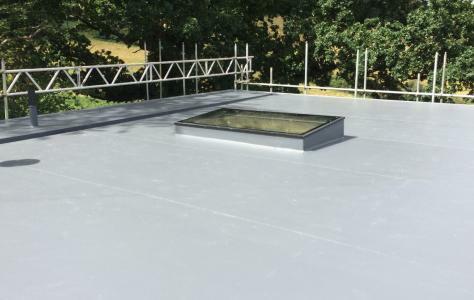 The high performance Sarnafil roofing system is fast becoming a favourite of self builders looking for a high performance and aesthetically pleasing roofing solution for their dream house project. Grand Designs host Kevin McCloud described the finished house as one that “commands the landscape”. He said: “Emerging from behind an old oak tree, what looks like a wooden cliff seems to have pushed its way out of the hill”.